The leader of a Christian advocacy group in India says that incidents of anti-Christian violence in the country have reached an “alarming level”, with more than 30 incidents a month being reported. 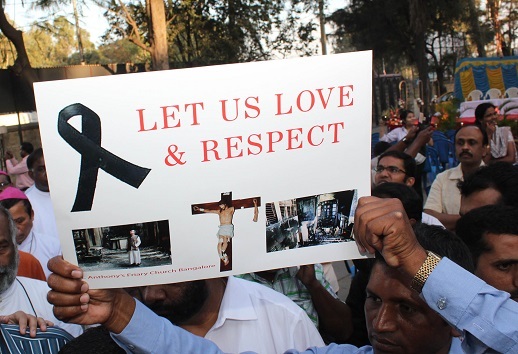 In January, World Watch Monitor reported that attacks on Christians were reported on an almost daily basis in 2015, according to the Mumbai-based Catholic Secular Forum. And Tomson Thomas, coordinator for Persecution Relief, says “the situation is getting worse in BJP-ruled states”. The BJP (Bharatiya Janata Party – Indian People’s Party), the party of Prime Minister Narendra Modi, is known for espousing a Hindu nationalist agenda and is ruling several states in central and western India, as well as controlling the federal government. Most recently, the advocacy group reported three major incidents of attacks against Christians between 17-22 July. The first incident took place on 17 July, when dozens of Hindu fundamentalists assaulted college student Umesh Patel, his father, Sudhama Patel, and their family friend, Kiran Vishwakarma, in Kamarud village, Damtari district, in the BJP-ruled Chhattisgarh state. Thomas said the three Christians were “brutally assaulted” for professing faith in Christianity and had to be hospitalised. The assailants also ransacked the Patels’ house. Thomas said the Hindu fundamentalists had been planning to target Patel as soon as he was released from bail. In a second incident, on 22 July, a 14-year-old Christian girl was raped and murdered. The scantily clad body of Sangeeta Siri – who did not return home from school – was found in a forest near Jattarbeda village, Kondagaon district, also in Chhattisgarh state. Thomas said that her father, Maner, suspected that his daughter was killed for his family’s faith. Pastor A. K. Netam told UCAN that it was “a revenge attack for her not abandoning her [Christian] faith”. He said the girl’s family had become Christians 18 years ago but had been under pressure from local Hindu leaders to return to Hinduism. In a third incident, in the neighbouring Madhya Pradesh state, also ruled by the BJP, a Pentecostal pastor and a member of his congregation were abducted, tortured, arrested by police and denied bail by the court. Pastor Rampal Kori, 38, and Nand Lal, 49, were dragged out of a prayer meeting on the evening of 21 July in the Mauganj area of Rewa district. Thomas said the abductors tied them to a tree, beat them with sticks, kicked and punched them, and accused them of converting Hindus to Christianity. The police, who arrived the next morning, arrested the Christians and imprisoned them, charging them with hurting Hindu religious sentiments and violating the provisions of Madhya Pradesh’s own “anti-conversion law”. “The court also initially denied them bail. They were bailed out on 27 July only,” said Thomas.